Hello, friends! 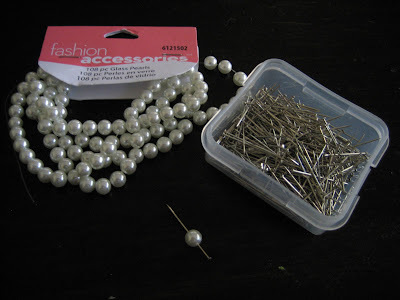 Have you ever had one of those projects on your to-do list that just keeps getting pushed to the bottom of the list? Well, over the weekend, I finally finished the middle piece for the art collage on my guest room wall. 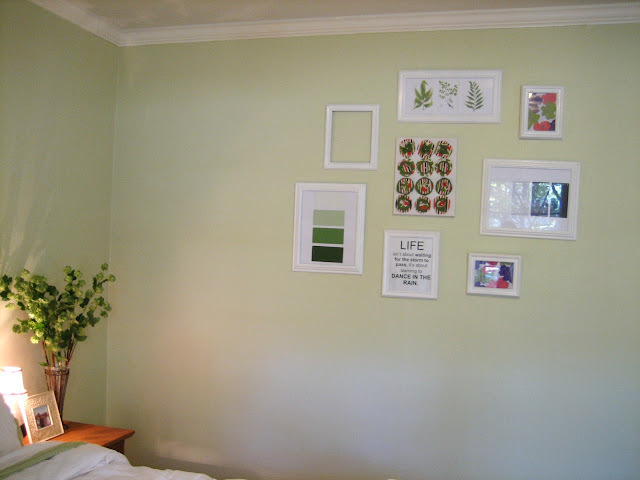 Read about the rest of my do-it-yourself wall art in this post. And what was my piece de resistance?? This adorable faux flower canvas. 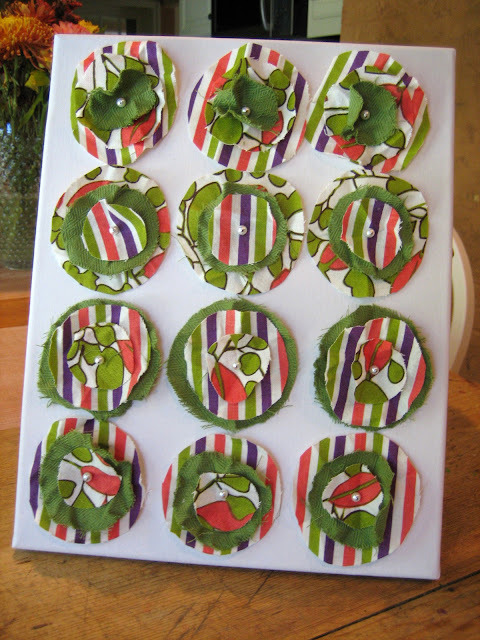 Several weeks ago, I saw a tutorial on this cute little project over on the blog Twelve Crafts Till Christmas. I knew it'd be perfect for our guest room wall, which just got updated. 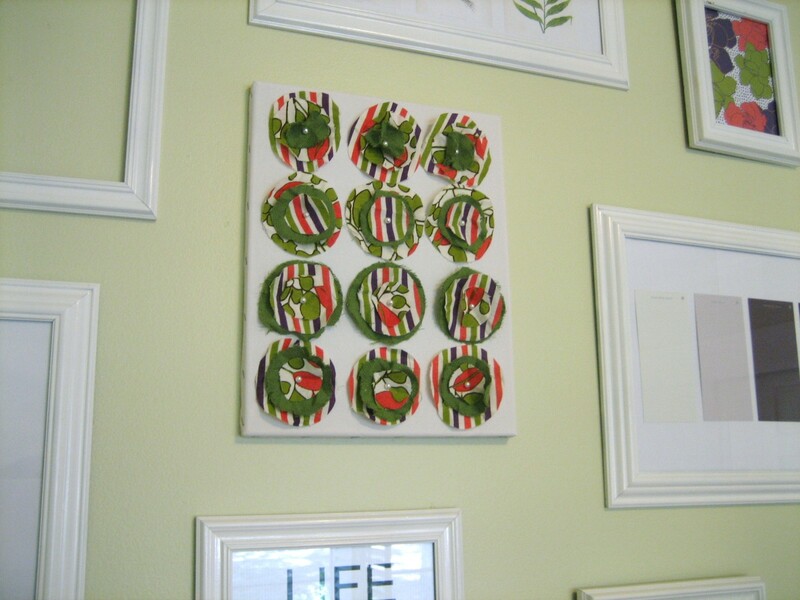 Here's a close up of the guest room wall art collage. See that blank middle canvas? Perfect spot for the faux flower wall art. It took me awhile to find fabric that I wanted for the project. 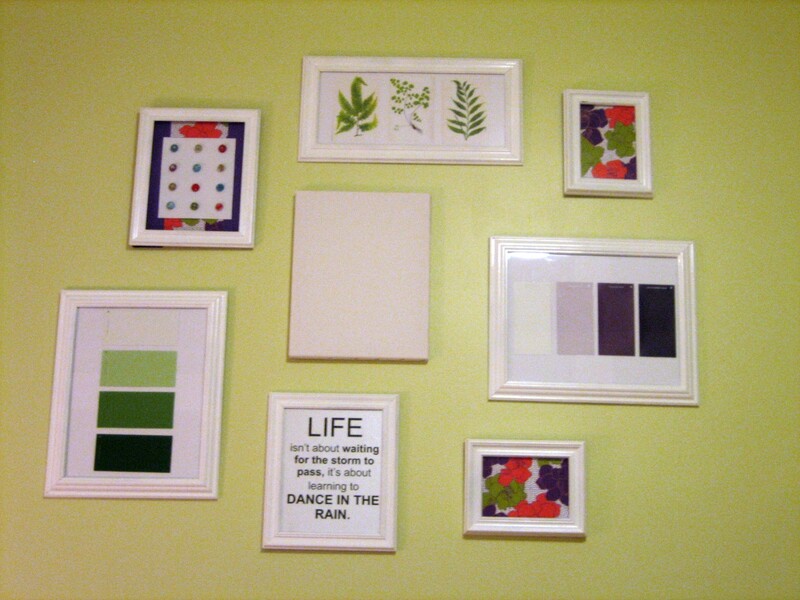 I love the purple, green and coral scrapbook paper that I framed and wanted something fun and funky to accompany it. 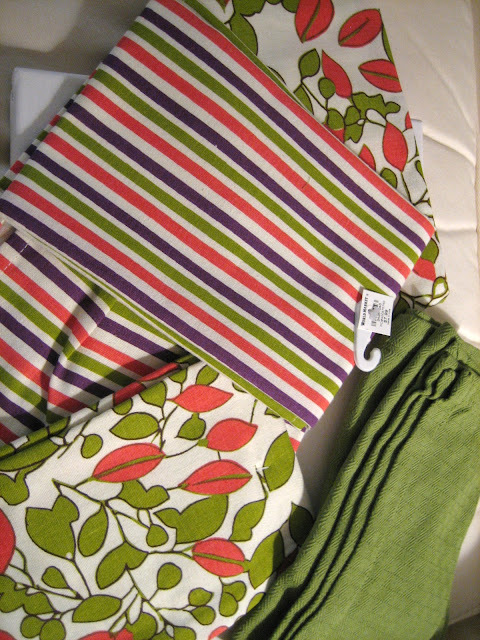 After searching through several fabric stores, I finally found exactly what I was looking for in the form of tea towels from Cost Plus World Market (on sale, half off! yesss). Let's be honest, I did a happy dance in the aisle- the towels match the existing wall art perfectly! I simply started by cutting circles in the fabric, alternating sizes and patterns. I then scrunched all of the circles up in a plastic baggie, so that the flowers would have a wrinkled, 3-D look. Next, I threaded each flower with a straight pin stuck through a faux pearl. 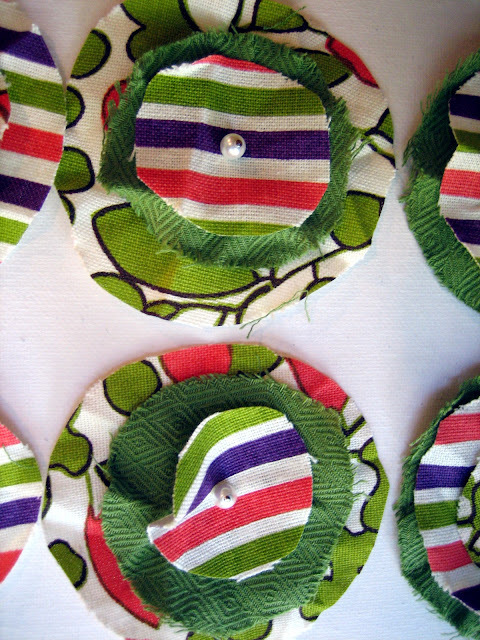 This makes the flower's center and it also connects each flower to the canvas. 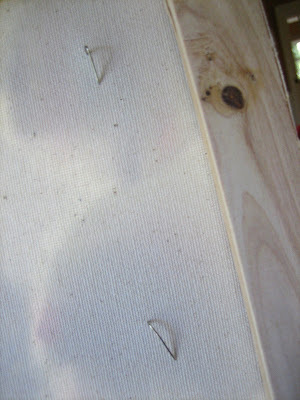 On the back side of the canvas, I bent each straight pin back with a pair of pliers so that it wouldn't scratch against the wall and so that it wouldn't slip out easily. Here's a close up of the finished product. I love it! It's exactly what I was looking for. Here's my new art hanging on the wall in the guest room. 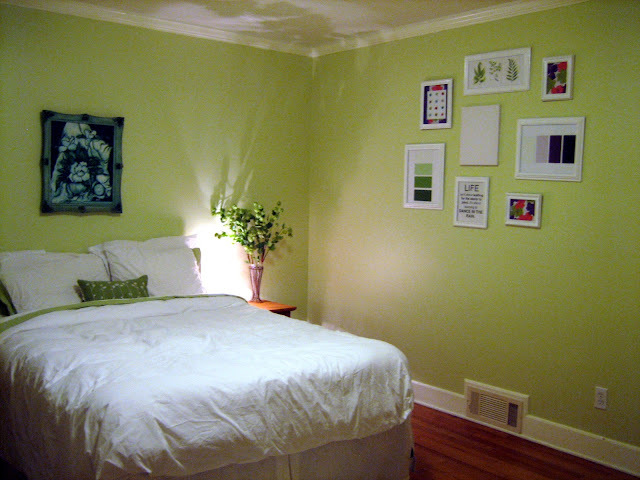 Lets not forget what this guest bedroom looked like before. Don't you think it's looking a lot better these days?! 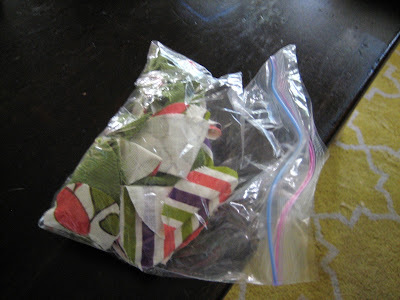 :) Thanks again to Twelve Crafts Till Christmas for sharing the idea! What do you guys think? Uber cute my dear!!! I love the use of the colors....so dainty and sweet. Wow! I love that entire wall. Every detail is awesome! Love it!! makes such a difference. very creative! It turned out great! I love that it's dimensional and the shapes aren't cut perfectly...all the more arty if you ask me. I'm coming back when I can be a little nosy...I saw something about Savannah. I've never been and I'm looking forward to a tour! Thanks for stopping by. These are so precious! You are so handy with crafts! Hey girl! THanks for your sweet comment! This is really cute! I wouldn't have ever thought to make it artwork! But I might have to try this! I love the corresponding fabric in the frames too!